THE economy may have slowed somewhat but Singapore's banking sector stood out in 2014 for its continued vibrancy, with local banks leading the charge while foreign ones ramped up their presence, especially in wealth management and trade finance. 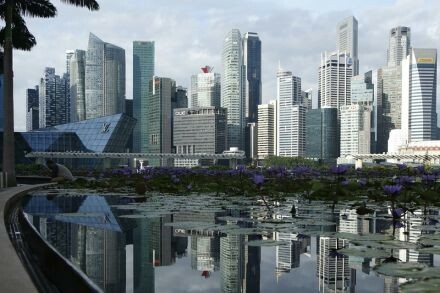 The Singapore economy is expected to grow 3 per cent in 2014, down from 3.9 per cent in 2013, the government said last month. In Q3, the strongest performance came from the finance & insurance sector, whose growth surged to 10.5 per cent year-on-year, from 5.5 per cent in the previous quarter. 2015 is expected to see banking and finance the star performer again, and banks which have been investing will gain the most. Among the notable deals in 2014 were transformative acquisitions by DBS Group Holdings and OCBC Bank. DBS, Southeast Asia's largest bank, completed the US$220 million acquisition of Societe Generale Private Banking Asia in October. That boosted its private banking assets under management (AUM) to S$88 billion; before the acquisition, its AUM was S$75 billion. The Societe Generale buy gives it a fair shot of rising up the rankings among the top 10 largest private banks in Asia. In a 2013 survey by Private Banker International, DBS was in ninth position. DBS is far from done. Chief executive Piyush Gupta said in October that DBS is keen on buying Coutts International, the non-UK private banking business of the Royal Bank of Scotland (RBS) when it is put up for sale. Reports this month said DBS is among several potential bidders for Coutts International, which had 32.6 billion Swiss francs (S$44.2 billion) in AUM at end-2013. DBS is also making waves elsewhere. In the lucrative transaction banking services business, its push in the trade finance business has clinched it a place among the international banks. HSBC continues to dominate across Asia in trade finance but, in Singapore, DBS has made it to the top three banks serving multinationals based here, according to the 2014 Greenwich Associates study on Asian corporates' use of trade finance. HSBC, Standard Chartered Bank, Citi, Deutsche Bank and ANZ Bank are the top five leaders across Asia serving large corporates. In Singapore, DBS ties with HSBC and Standard Chartered in providing corporates with an international network matching their trade flows, it said. OCBC Bank too made a transformative deal this year, with its S$6.2 billion acquisition of Hong Kong's Wing Hang Bank, which has 95 branches in Hong Kong, China and Macau. Its network in China has increased from 16 to 31 branches following the acquisition. Of particular significance is OCBC's expanded footprint in the Pearl River Delta region, one of China's main hubs of economic growth. OCBC now has 67 branches in Hong Kong, compared to just one previously. It has gained 13 branches in Macau; it had none before. Meanwhile, United Overseas Bank (UOB) has stepped up its marketing, targeting the wealthy and affluent segment at home. In June, it brought in a new management team for its private bank unit helmed by Ong Yeng Fang, who was previously managing director at Bank Julius Baer. UOB Private Bank this month launched a regional advertising campaign to establish itself as the leading boutique private bank in Asia. It will also be hiring more private bankers next year, said a UOB spokeswoman. "The campaign, which started last month and will run throughout 2015, aims to communicate the business values such as trust, integrity and honesty, which form the foundation of UOB Private Bank," she said. UOB, which has 77 branches here, is embarking on a branch refresh. The pilot new branch is at UOB Suntec, which has been transformed into a wealth management advisory centre featuring, among other things, videos that tell the stories of Singaporeans achieving their dreams through financial planning, she said. Foreign banks based in Singapore have been no less busy, ramping up their operations in retail and private banking as well as trade finance. UK-based HSBC, a qualifying full bank, opened two new branches in the past six months in a bid to further boost its retail business here; it now has 11 branches. One unveiled this month is in the affluent neighbourhood of Bukit Timah, six months after it opened its flagship 12,000 square foot Liat Tower branch, smack in the centre of the swanky shopping district of Orchard Road. The Liat Towers branch is staffed by a 100-strong team. "We have delivered remarkable achievements in our retail banking and wealth business, with the opening of two retail branches in Orchard and Bukit Timah . . . which target the top affluent and emerging affluent segments," said Matthew Colebrook, head of retail banking and wealth management, HSBC Singapore. "Moving into 2015, we will continue to build relationships with globally-oriented and affluent customers as this is the cornerstone of our retail and wealth business," he added. Morgan Stanley, a bulge bracket Wall Street investment bank and the world's largest brokerage, is stepping up its private banking business in Asia, following a 2013 review. It currently has about 100 private bankers in the region, split between Singapore and Hong Kong. It expects to hire 15-20 per cent more experienced private bankers over the next 12-18 months as the bank pursues organic growth, said Vincent Chui, Morgan Stanley managing director and head of Asia institutional equity distribution and private wealth management, last month. In the Asia-Pacific region, the group has about 5,500 employees. Japanese behemoths The Bank of Tokyo-Mitsubishi UFJ (BTMU) and Mizuho Bank made Singapore their Asia and Oceania headquarters last year, as they go after more trade finance and cash management businesses among the region's ever-expanding corporates and multinationals. For BTMU, Japan's largest lender, that move boosted its Singapore staff to 1,200 from 600 a few years ago. The bank expects to be hiring more to reach ambitious growth targets of 8-10 per cent per year for the next three years for its Asian and Oceania business. As for Mizuho Bank, which is also ramping up its overseas expansion, the bank will increase its 600-strong staff in Singapore by about 50 per cent over the next few years, said Takuya Ito, its general manager for Asia & Oceania, in a September interview. With the year drawing to a close and financial markets unexpectedly wobbly, hit by worries over spillout from the Russian rouble crisis, Singapore's banking landscape is well placed to provide financial services not just to the domestic economy but also to the region, which continues to expand briskly. According to the Ministry of Trade and Industry (MTI), the global growth outlook for 2015 is uneven, with the US recovery expected to improve and weak growth in Europe. Asean economies should remain resilient, though Japan is likely to be sluggish and China continues to slow. In tandem with the expected pick-up in external demand, externally oriented sectors such as manufacturing, wholesale trade and finance and insurance are likely to provide support to growth, MTI said.